Foster, John E.. "Pemmican". The Canadian Encyclopedia, 20 December 2018, Historica Canada. 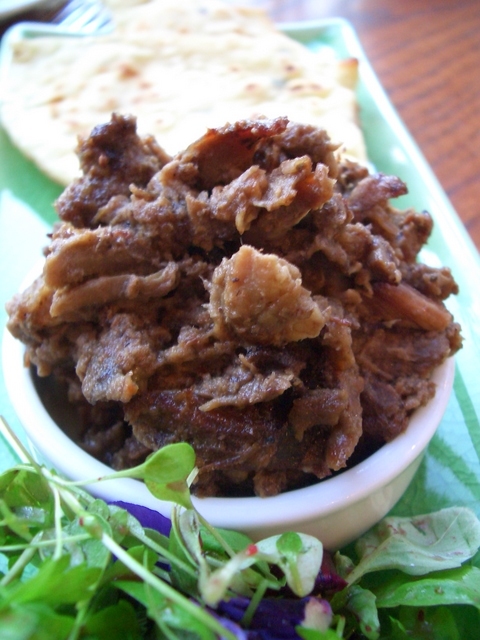 https://www.thecanadianencyclopedia.ca/en/article/pemmican. Accessed 20 April 2019.
Credit: are you gonna eat that/flickr cc. 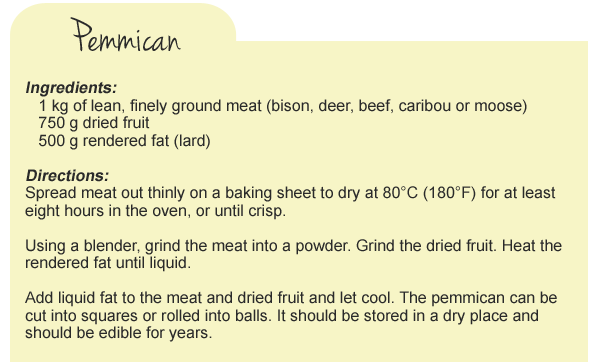 Pemmican (Creepimikan, meaning "manufactured grease") is dried meat, traditionally bison (moose, caribou, venison or beef can be used as well), pounded into coarse powder and mixed with an equal amount of melted fat, and occasionally saskatoon berries, cranberries, and even (for special occasions) cherries, currants, chokeberries or blueberries. Cooled and sewn into bison-hide bags in 41 kg lots, pemmican was a dense, high-protein and high-energy food that could be stored and shipped with ease to provision voyageurs in the fur trade travelling in the prairie regions where, especially in winter, food could be scarce. Peter Pond is credited with introducing this vital food to the trade in 1779, having obtained it from the Chipewyans in the Athabasca region. Later, posts along the Red, Assiniboine and North Saskatchewan Rivers were devoted to acquiring pemmican from Aboriginal peoples living in the region as well as the Métis. Métis travelled onto the prairie in Red River carts (carts constructed entirely of wood and lashed together with leather), killed and butchered bison, converted the meat into pemmican, and shipped it in bags to such fur trading posts as Fort Alexander, Cumberland House, Fort Garry, Norway House and Edmonton House. Pemmican was sufficiently important to the regional economy that, in 1814, Governor Miles Macdonell passed the disastrous but short-lived Pemmican Proclamation, which forbade the export of any food supplies, including pemmican, from the Red River Colony, nearly starting a war with the Métis. Pemmican was also made and used outside the region, by the Royal Navy, for example, which provisioned several Arctic expeditions with beef pemmican made in England. Pemmican can still be useful snack when exploring the backcountry, and it can be made in reasonable quantities and in a reasonable amount of time in a modern kitchen. While there are several variations on the dish — depending upon the meat used and what is being added — what follows is relatively standard.